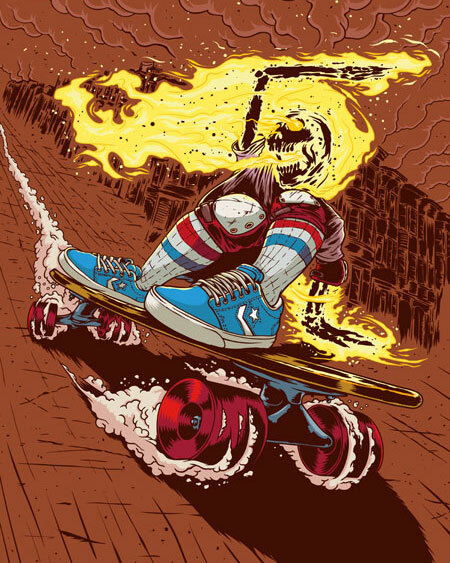 Flaming skeletons, howling zombies, a VaporMax morphed into a bright orange scorpion, classic Vans paired with chopped-off legs and Air Max 90s as pizza toppings: The work of Barcelona-based graphic artist Marcos Cabrera is a vibrant mash-up of 1980s-style skateboard graphics, heavy metal poster art, horror comics and a healthy dose of sneaker spirit. 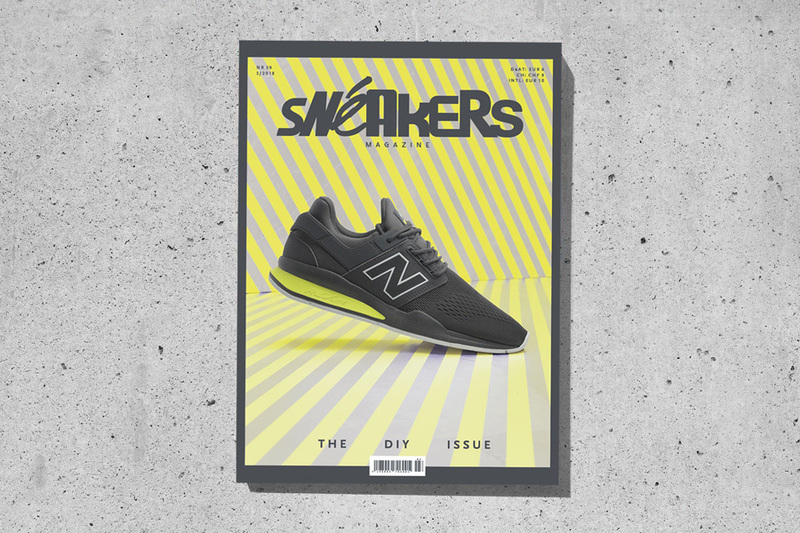 It’s a heady mixture, full of pop-culture references and hyperlinks deep into the vaults of sneaker culture. It all began when Marcos Cabrera grew up on the Canary Islands with a head full of underground comics and iconic skateboard graphics. Filling sketchbooks DIY-style with his own fantasies – plus the 1980s sneaker grails he wanted but could never afford – opened a path that would lead Marcos to pursue a fine arts degree and afterwards move to Barcelona. 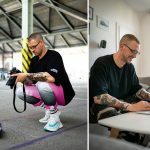 Fourteen years later, he has turned his DIY roots into a career and works as a full-time designer and illustrator with deep hooks in the art, sneaker, music, and skateboarding scenes. SNEAKERS caught up with Marcos Cabrera at his Barcelona studio. Please introduce yourself and your graphic art career to our readers. What kind of art influenced you growing up? I grew up on the Canary Islands and got into skateboarding in my early years around age ten. But I actually spent more time drawing the graphics I would see on skateboards than doing tricks. My father worked at the airport in Tenerife where they had magazines from all over the world, and one day he brought me an issue of TransWorld SKATEboarding magazine. There was a huge feature about Tony Hawk and his new board – the graphics were so amazing. So I spent a lot of time copying graphics by Pushead, Jim Phillips and Vernon Courtlandt Johnson. And I was also into horror and underground comics by Robert Williams, Richard Corben and Rat Fink by Ed Roth. That entire style features really clean line art, which carries into your work today. Did anyone teach you that technique, or did you master it all by yourself, DIY-style? I started by replicating the graphics from skateboards by tracing the outlines. I was always copying the skate decks my friends had and the boards I saw in the magazines. In the 1980s we got a skateboard shop in Tenerife with all the skateboards from the US like Zorlac with the art of Pushead, one of my favorite artists. There were only a few opportunities to get magazines back then on the islands, so when some parent brought one it was 12 to 15 kids checking out the magazine. It was amazing, like a shock! Did you ever think that your passion for drawing could turn into something “serious”? Several years later I discovered Juxtapoz magazine and thought that if these artists can make money doing this, maybe I can do the same (laughs). So I decided to study fine arts at the university. That brought formal introduction training and opportunities to make a move into going professional? Yes, but I was already working on the side as a designer for magazine production companies. Then I decided to move to Barcelona with my girlfriend, who is now my wife. That led to working for some small companies here in the city, then all over Spain, and one day Jart Skateboards contacted me to do some of their board graphics – and now they are one of the biggest skate brands in Europe. You’ve also gone from your self-taught roots to doing official work for Converse, Vans and the Loversneakers tradeshow in Barcelona. 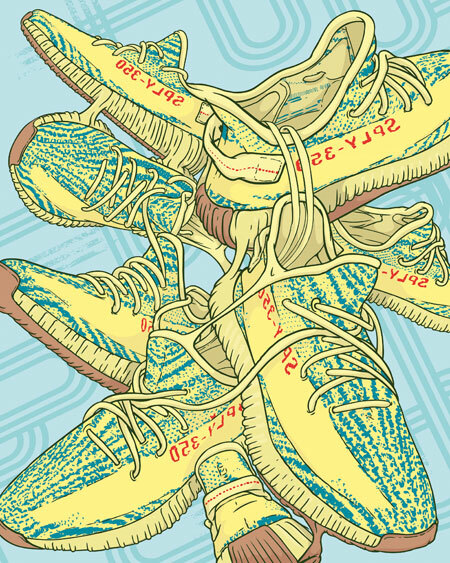 What‘s your unique perspective on incorporating sneaker designs into your artwork? 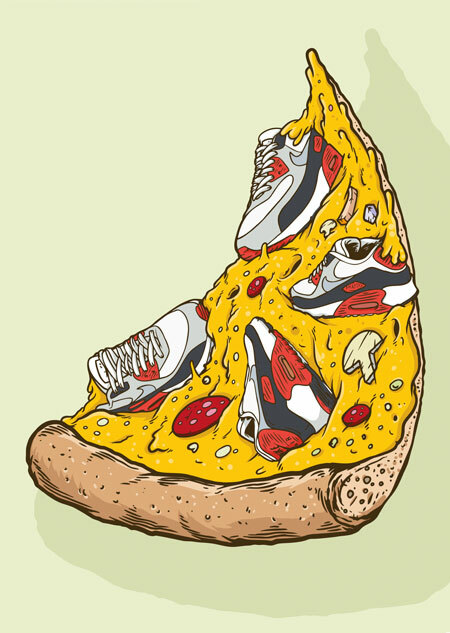 I have always thought of sneakers as cultural icons. I can remember as a kid seeing the first Air Max or the first Air Jordan or Patrick Ewing sneakers. 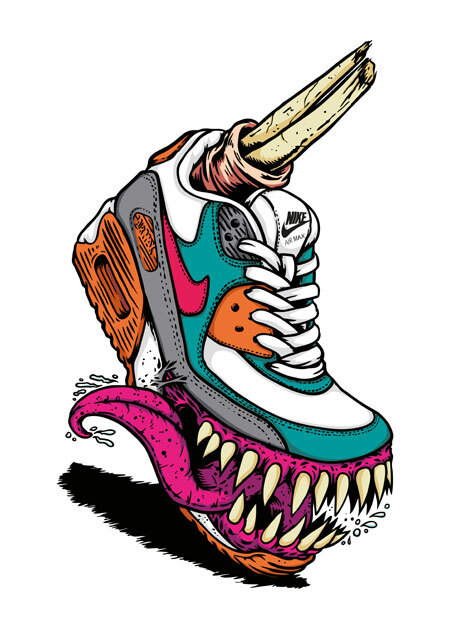 And I instantly felt an attraction, although I never went deeper into drawing sneaker art until a few years ago. I always had my drafts, and my rolls, and my sketches, but I viewed it more as a kind of personal work for fun, while today it is really important work for me. 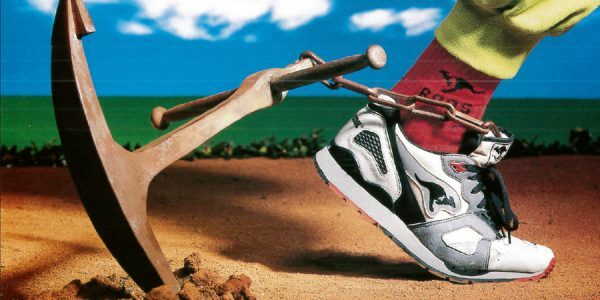 You mentioned being attracted to sneakers as a kid; what caught your eye? I come from a really poor neighborhood on the island. So whenever a kid had a new pair of sneakers it was like a big event! When this guy had the early Jordans or the Nike [Vandal] sneaker from the Terminator movie. 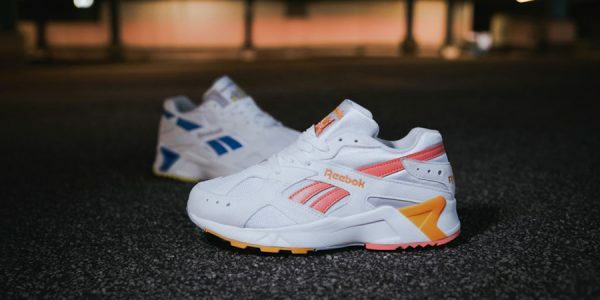 These kinds of sneakers were my early love for sneakers. So I began to draw this guy fighting the Terminator wearing these kinds of sneakers and kept drawing sneakers all the time. But with sneakers you can’t really trace the outlines DIY-style like a skateboard graphic. 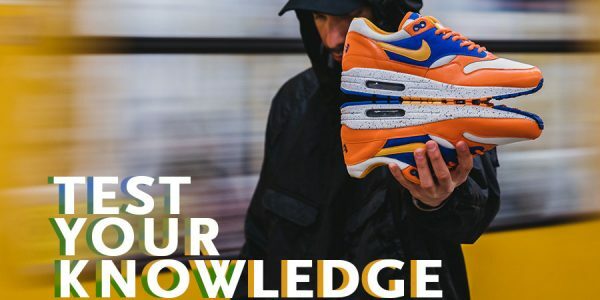 What is your process for bringing a sneaker onto the page? My process is that I always like to mix concepts. 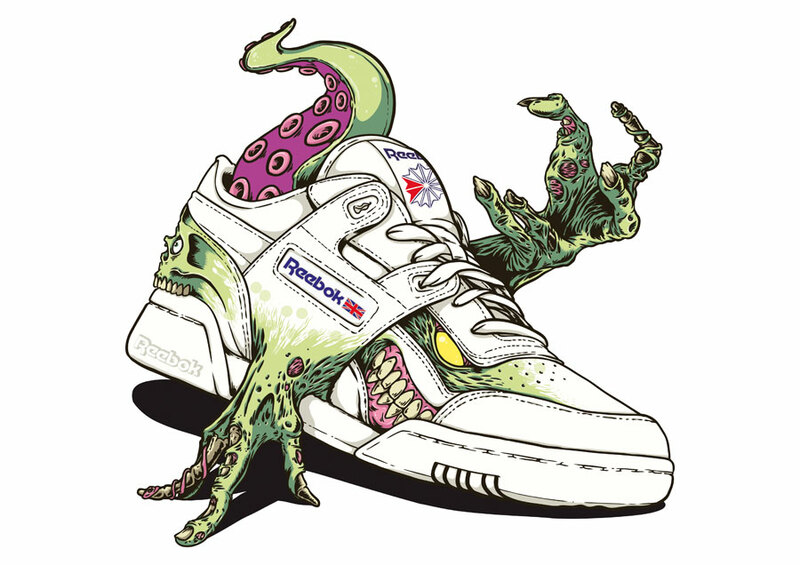 One of my favorite ways to draw sneakers is to transform them as monsters. A lot of people in sneakers are fancy and wear them because it’s trendy. But I like things melting and monsters and blood. 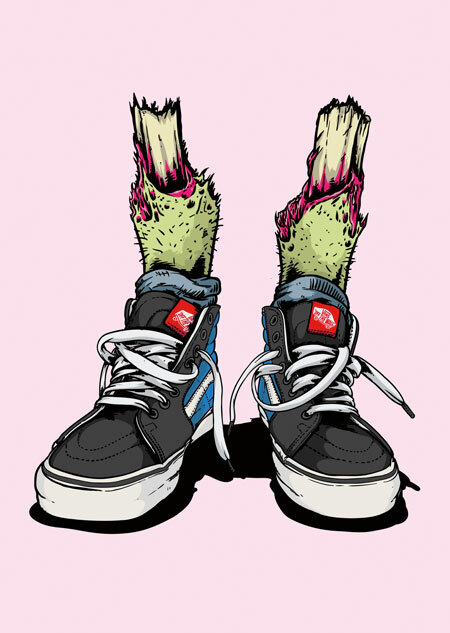 I believe it’s okay to be weird and that also comes from skate culture, like the idea of ‘Skate and Destroy’ and that whole punk feeling is something that has been missing. 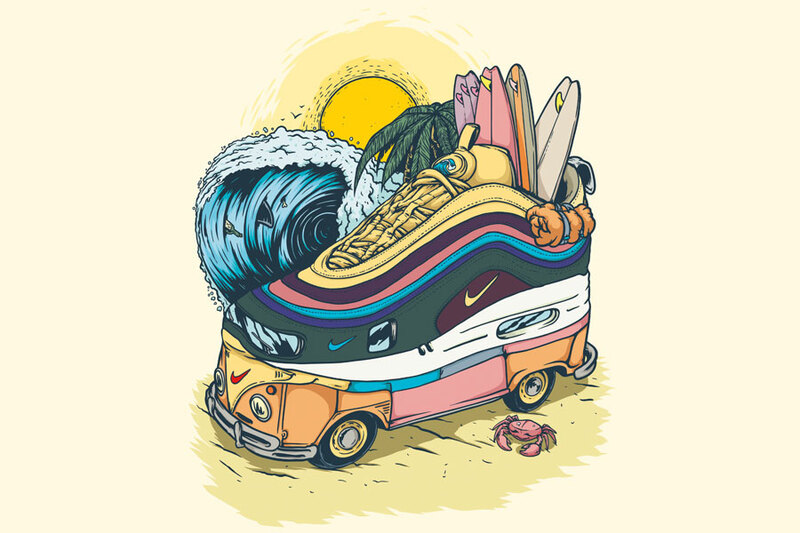 Or I like to create a concept around a sneaker, like the surfboard-themed beach scene with the Air Max 1/97 designed by Sean Wotherspoon and the wave. 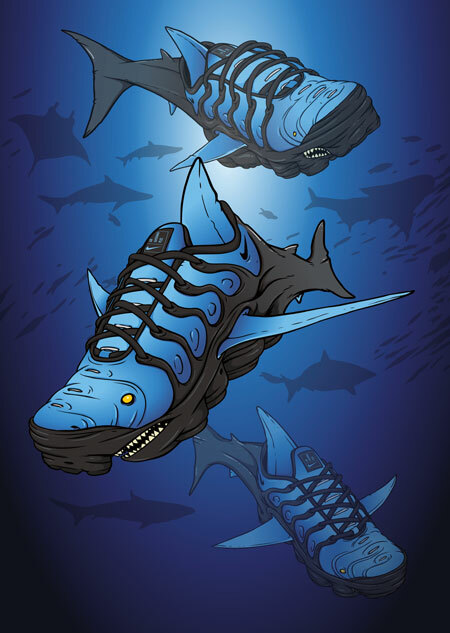 I also enjoy transformations, like drawing the VaporMax as a blue shark or scorpion. For me it’s similar to designing a skateboard graphic. Coming up with a concept and making it possible on a deck. Skateboards also say something about the personality of the rider, a lot like sneakers, right? Exactly. Not the same guy buys a deck from Creature Skateboards and Flip Skateboards. It’s more about the way you feel, the way you skate. And it’s the same with how people wear sneakers. 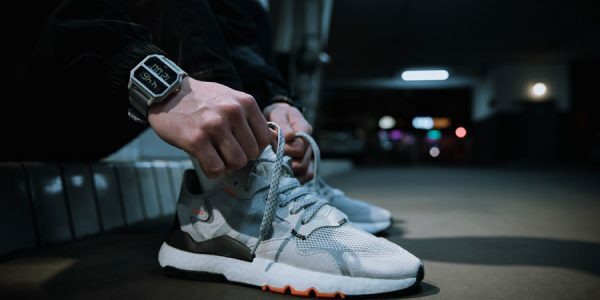 Speaking of brands, do you have a favorite sneaker brand? Not so much a brand; I really like models. I have always loved the Air Max 90, the early Jordans especially in white, red and black. Early skate sneakers by Vision and Airwalk. I like when designers mix ideas, concepts, materials and colors. Right now, I like all the crazy sneakers designed by Virgil Abloh. 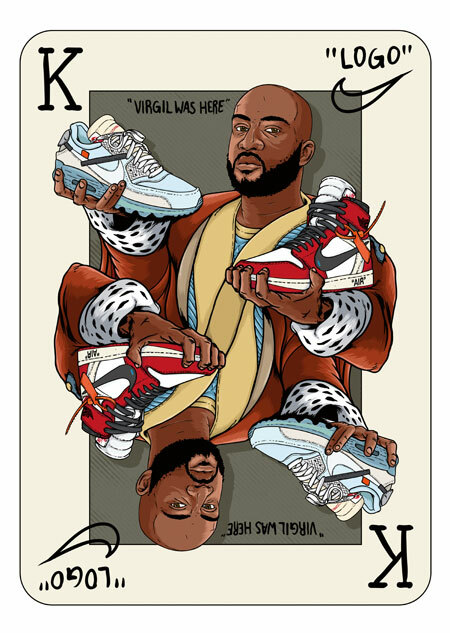 You drew a Virgil Abloh playing card that stylizes the famous designer as the King of the deck. 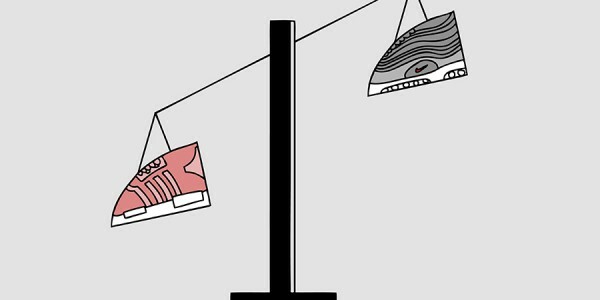 What interested you about the way he treats sneakers? It’s crazy how a designer like him became so big in the sneakers world. 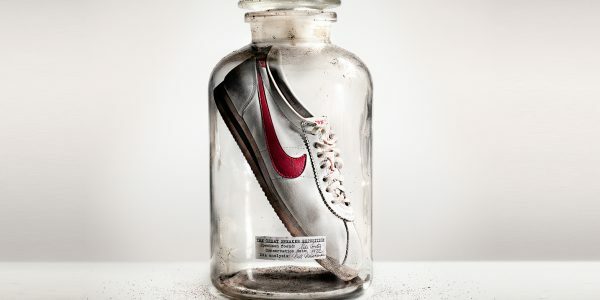 His last work for Converse with the translucent Chucks is amazing. I think he’s having a lot of fun with it. He’s doing a lot of crazy things, and the brands agree. It’s more than just design and making a lot of money for brands; it’s also breaking the law in a way. That’s why I drew him as a King in poker, because right now he is breaking everything and people want to see what he does next. 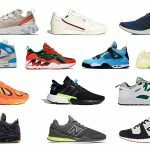 On the subject of what’s next, what are people in the Spanish sneakers scene into right now? My good friend is the owner of a sneakers store called sivasdescalzo, and he has introduced me to lots of people in this world. 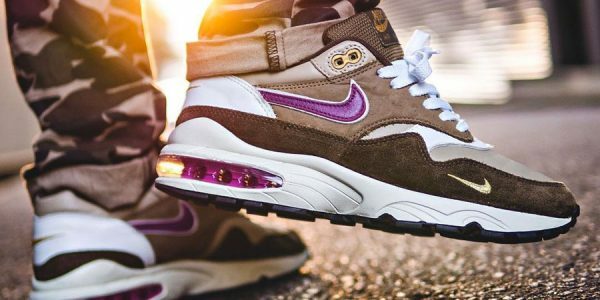 There is a lot of movement around sneakers here in Barcelona and also in Madrid. It’s less of a scene, more like people doing their own things around sneakers. I have been doing graphics and windows and promotions for stores here in Barcelona around sneaker releases, also T-shirts. 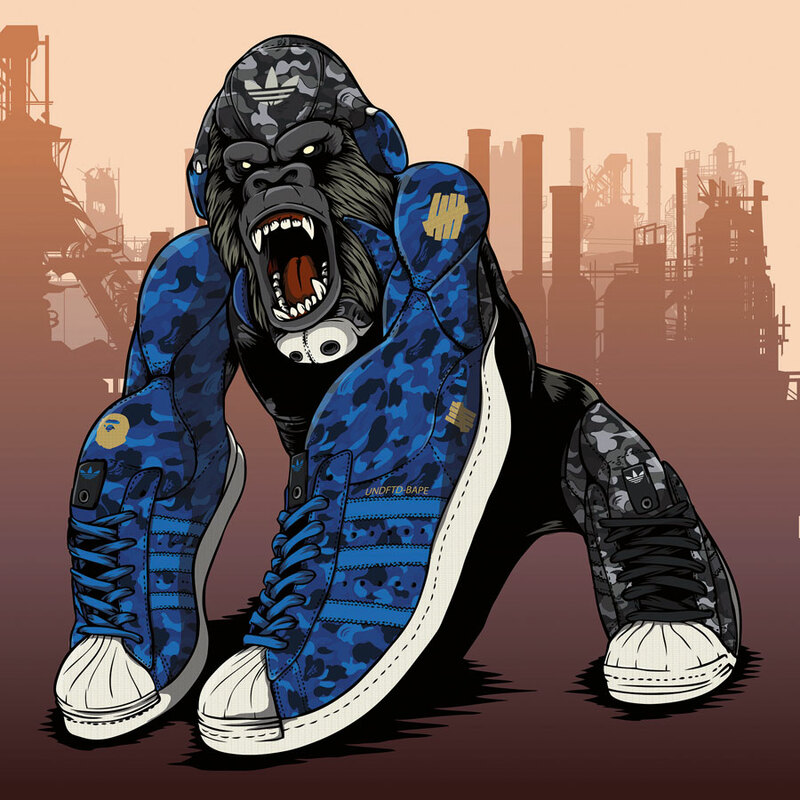 And I follow Hypebeast, Sneaker Freaker, Sneakers Magazine to discover all the latest news and releases around sneakers. 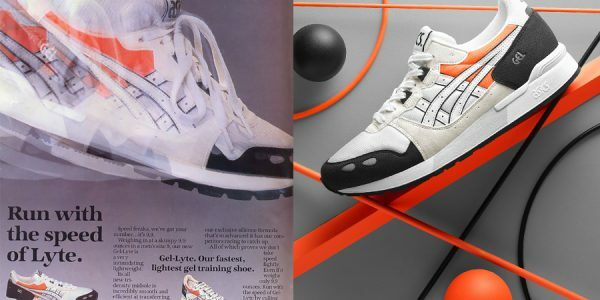 Sneakers have gone from a small scene to high fashion now. Have you seen the new Balenciaga sneaker? 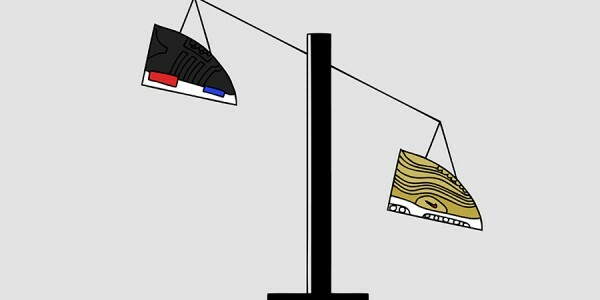 For me that’s a kind of huge, big sneaker from a certain era that is now super expensive. It reminds me of people who used to go to rave parties in the 90s. With huge Buffalo Boots and these big sneakers. 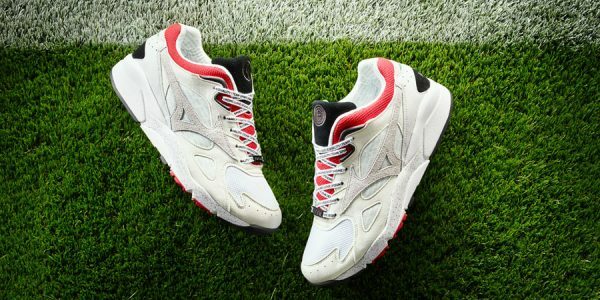 So it’s weird when a major, high-fashion brand designs these kinds of sneakers deriving from the fans who were taking drugs at the raves. And now ladies with high-heel boots wear them, which for me is an interesting idea. Perhaps it’s an example of a do-it-yourself culture being appropriated into the mainstream? 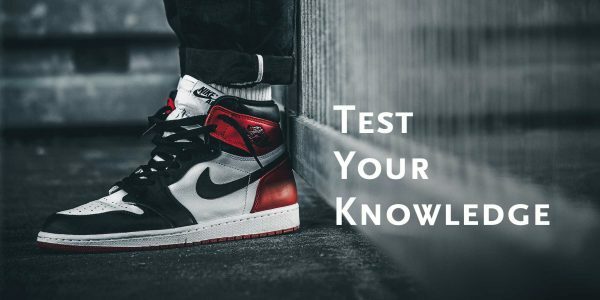 I think it’s interesting how certain groups of people can take a brand or a model of sneaker and make it a part of their tribe. 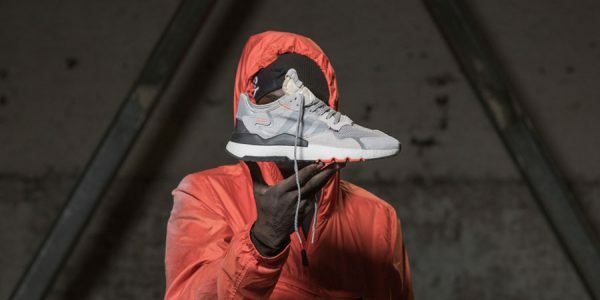 Like the Buffalo sneakers and pants from the ravers. And the guys who are into skateboarding wearing Vans or the guys from the ghetto who grew up breakdancing wearing Pumas. Now suddenly everything is mixed. I’m finishing some decks for Cruzade Skateboards and working on an entire series of sneaker personalities like the Virgil Abloh portrait. I also want to make one with Pharrell Williams and Tupac, and another one with Kanye West in a design like the Yeezy 700 sneaker in terms of colorways. I just finished portraits for skate icons Tony Alva, Christian Hosoi, and Steve Caballero with Vans. Also some merch for metal and rock bands and posters for Street Mode Festival in Greece, plus my personal project “All is Full of Monsters” where I draw big monsters on walls. Right now is one of my busiest months so far. Busy is good. Any final words? 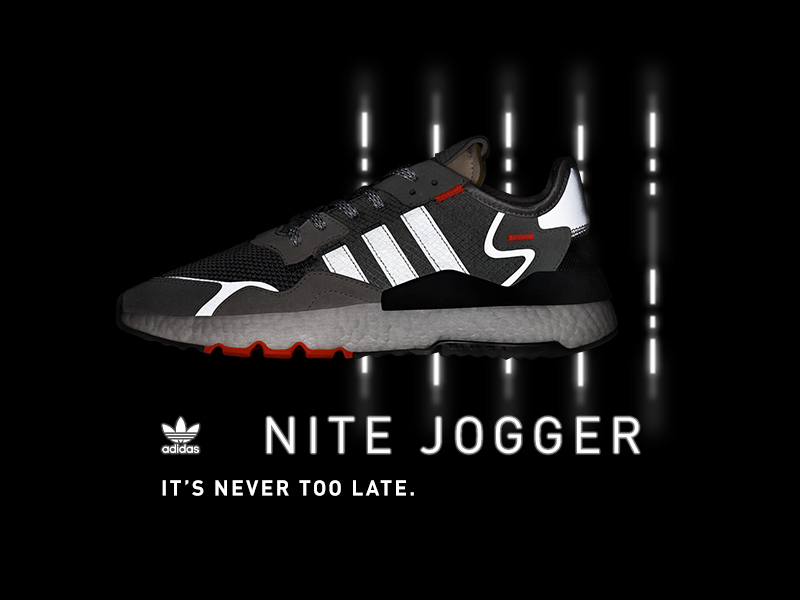 I really would like to design a sneaker; that would be my dream. Perhaps someone will read the interview and get in contact. Thank you, Marcos.